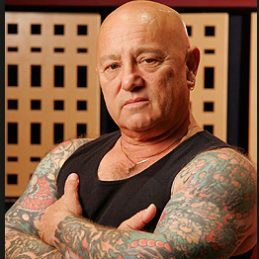 Angry Anderson is an unquestioned legend of Australian rock, with decades in the Australian music industry, shocking, amusing and entertaining a generation. Short on stature, but big on lip and a chip on his shoulder almost as large, Angry took to rebellion and rock n roll like a duck to water in his teens, first in Melbourne 70s garage band Buster Brown and then a move to Sydney to form the seminal Rose Tattoo. “The Tatts” were the epitome of wild boy Aussie rock in the 70s. While Skyhooks were donning makeup and Richard Clapton was singing about Girls on the Avenue, Rose Tattoo spoke to the lunatic fringe. They played hard, they played dirty and they lived punk before punk was punk. Inspiration to bands that would come after including Guns n Roses, Rose Tattoo blitzed the Australian charts with hits including We Can’t Be Beaten, Bad Boy for Love and Rock n Roll Outlaw throughout the 70s and 80s before Anderson went solo, having further hits including Bound for Glory and Suddenly. He has also had successful stints on the stage (Jesus Christ Superstar, Rasputin) and screen (Max Max: Beyond the Thunderdome, Bullamakanka) and has a variety of awards to his name including the Advance Australia Award, the Australian Media A.M. and many more. Anderson has also worked tirelessly for charity, becoming an active spokesperson for men’s health causes as well as various hospital and children’s charities as well as hosting “The Challenge” on Channel 9, using his celebrity to galvanize the community to help those in need.